Newlyweds Joy (Duggar) Forsyth and Austin Forsyth are featured on page 87 of this week's edition of People Magazine. Fans can see photos of the couple, who married at Cross Church (the same church as Jill and Derick were married at but a different campus), the rings, and the ceremony program. The article also includes a picture of Joy-Anna and eight members of the bridal party (matron of honor Jill (Duggar) Dillard and bridesmaids Jana Duggar, Jessa (Duggar) Seewald, Jinger (Duggar) Vuolo, Anna Duggar, Johannah Duggar, Jennifer Duggar, and Kendra Caldwell. Joy-Anna's dress was designed by Renee Miller, the gal who designed Jinger's wedding gown. Looking forward to giving you an exclusive, behind-the-scenes look at something related to that. Stay tuned! Labels: Anna Duggar, Austin Forsyth, Jennifer Duggar, Jessa (Duggar) Seewald, Jill (Duggar) Dillard and bridesmaids Jana Duggar, Jinger (Duggar) Vuolo, Johannah Duggar, Joy (Duggar) Forsyth, Kendra Caldwell. So excited for these newlyweds! Congratulations! Please post the newest TLC promo ... some of us don't have TVs! Thank you. Why do you encourage your readers to purchase a copy of people magazine? What a great looking couple! So happy to hear the good news. Congratulations Joy! I've enjoyed watching you grow up on TV and cannot wait to see what the next season of life brings you. I love that picture of the Forsyths. They look so cute together! this is a beautiful photo.. It's funny that they say that don't post profane, insulting, derogatory, or in poor taste - comments. But somehow these trolls on here seem to get pass that and their comments aren't taken down. Also, if they don't like the Duggars or just like to pick at everything they do, why are they on here to begin with? That's what I'd like too know. Why this magazine? It doesn't hold to their values. It pays good money. Isn't that one of their values? TLC can be just as trashy. Neither does TLC. I think they will gain a bigger audience by using a secular platform. Can't wait until you can show and tell us more! What is so hard about calling a grown woman a woman? The designer isn't a "gal." Your life must be GREAT to nit pick at a non-issue like this. Count your blessings, sir or ma'am!!! 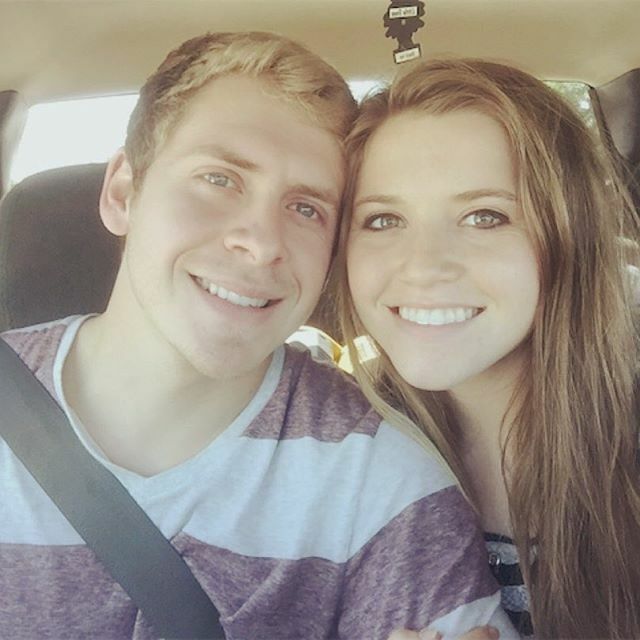 It's interesting that Austin highlights his hair, considering the Duggar family has said it's worldly and not god-honoring. Maybe that's only when women do it? It could be natural (from the sun) :) My hair does the same thing. The Duggars never said that. Some of the girls have dyed their hair. Stop trying to spread fake stuff that you have no back up proof of. I believe I've seen some unnatural, not God-given highlights and colors in Duggar women's hair, too. Mary Duggar must color her hair, for starters, and Michelle probably didn't get to be her age without a few gray hairs that somehow don't ever show. The other girls seem to go blonder sometimes. Jessa looks like she might have some ombre coloring happening right now. Not so sure that's bleaching in Austin's hair...maybe? I know guys with light brown hair who go very blonde in the summer when out in the sun a lot. It's highlighting because you can see the back portion is darker. They wrote about it in their book. Why do the Duggars, who claim to hold such high morals and christian values associate themselves with this magazine? It is no better than any other tabloid. The cover story is about Jennifer Garner and she has had to issue a statement saying she never gave an interview and that the information in the article isn't true. To allow their stories to be put in the magazine as an 'exclusive' and selling photographs shows hypocrisy on their part, and proves these articles are allowed purely for publicity and money. Why shouldn't they be paid? They are sharing their lives and pictures just as any celebrity does with the public. I would want paid. They are giving up their privacy for for the entire world to criticize. There is no amount of money worth that, IMO. Let them have the few dollars they do get compensated. I am sure the mental stress of public scrutiny is not worth what they make. I don't know how they put themselves through it. God bless them for sharing their lives and being a positive spark in this dark world. The same goes for TLC. They don't judge people. I can't wait to see their wedding on TLC!! Lilly and Ellie, when does the new season of counting on start? Thx! They look happy and they are look a likes. 3:45, it TLC will eventually post it to YouTube but I don't know when. I live in Australia and even though I do have pay tv, we don't get the new seasons until months after it has finished airing in the US, but I have been able to watch them on YouYube. Yes, when is the wedding episode going to air? Michelle and Mary Duggar obviously color their hair...I guess it's 'ok' for them as it frames their countenance, which is what they want men to took at. Anonymous @ 12:21- how do you know that Austin highlights his hair? I have 2 boys who were blond when younger, and when they're out in the sun a lot, their now light brown hair gets blondish streaks that look similar to Austin's. Looking forward to hearing about Renee Miller's work. I thought the Duggars don't like being written about in magazines. Why do they keep selling these exclusives to them then? Out of all the girls wedding dresses, Jinger was the most beautiful dress. Why wasn't Carlin Bates in the bridal party? I know they are best friends.